1: piat : control of the front derailleur and rear brake via pulleys. rear rack with protection for the cantilever brakes. seatstay braze-ons for carrying replacement spokes. 2-3: longoni : quick release system for brakes in working position, and in position for removal of the rear wheel. 4: hugonnier - routens : lengthened stem to support the handlebar bag, on the winning tandem of Paris-Brest-Paris; note the two brackets for a flashlight. 5 : ferdinand : drum brake mount formed by a reinforced wire bracket between the seat- and chainstays. 6 : liberia : clb brake cable stop forming a guide for the cables. 7: liberia : original design for the rear of a mixte frame, with hanger for cyclo derailleur. 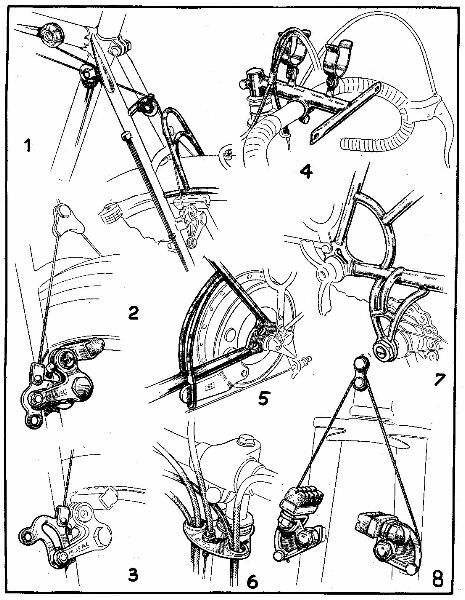 8: marcadier : cantilever brake whose shoes can be raised instanteously for wheel replacement, and which automatically reposition themselves at the first application of the brake lever.